I’m starting a revolution. ANOTHER revolution, to be exact. Around the sun. And it begins today. Because today… is my birthday! Yes, that’s right! And I’d like you to know it’s totally OK if you forgot to get me something. Because it’s NOT TOO LATE! You should know, I got YOU something too. Coming up in June, I’ll have new character concept art to share as well as promotional giveaways as the September 25th release date approaches. (Hint: by pre-ordering NOW, you’re eligible for the drawing. Just sayin’!) Stay tuned! 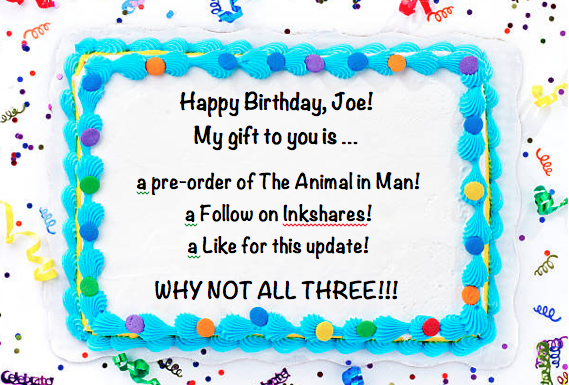 As always, THANKS to all the supporters of The Animal in Man.